Turkish rabbi: pupil of Alfandari the Younger (see Azulai, "Shem ha-Gedolim," and Grätz, "Gesch." x. 360); born at Constantinople in the second half of the seventeenth century. He settled at Jerusalem; subsequently he traveled as messenger of the city of Hebron, without receiving compensation, and afterward returned to Jerusalem (Azulai, l.c. ; Luncz, "Jerusalem," i. 130, No. 238). 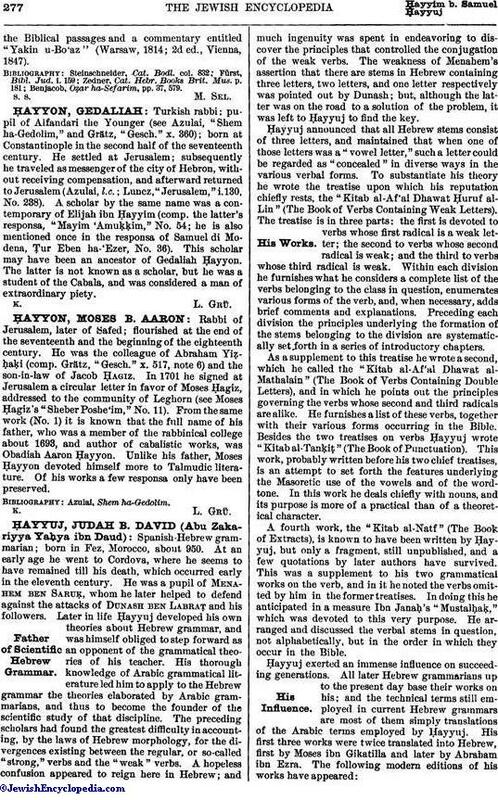 A scholar by the same name was a contemporary of Elijah ibn Ḥayyim (comp. the latter's responsa, "Mayim 'Amuḳḳim No. 54; he is also mentioned once in the responsa of Samuel di Modena, Ṭur Eben ha-'Ezer, No. 36). This scholar may have been an ancestor of Gedaliah Ḥayyon. The latter is not known as a scholar, but he was a student of the Cabala, and was considered a man of extraordinary piety.